Vernon Paul Curnow, a retired Army veteran of World War ll, peacefully passed away on January 26, 2010, after a lengthy illness. 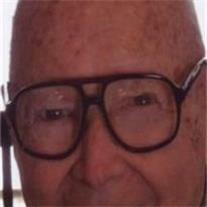 He was born July 6, 1914 in Central City, Colorado, and was the oldest of five children. He graduated from East High School in Denver. He entered World War ll in 1944 and retired as a LT. Colonel after 20 years of service. Vernon was an accomplished diver, trampolinist, and skater. He was a member of the Church of Jesus Christ of Latter Day Saints and served in several church callings. He spent most of his spare time working on cars. He lived most of his life in Colorado, but in 1988 he moved to Mesa, Arizona where he spent the last 22 years. Proceeded in death by Joseph Curnow (father), Mabel French (mother), Raymond Curnow (brother), Paulene Juhnke (sister), and Robert Curnow (brother). He is survived by Eileen Curnow, his sweet wife of 62 years, and his three children Richard (Joyce) Curnow, Verleen McDougal, and Stanley (Amy) Curnow. He leaves behind 16 grandchildren, 18 great-grandchildren, 4 great-great grandchildren, Alberta Pierce (sister), and several nieces and nephews. His family was so blessed to have such a sweet, kind, and caring husband, father, and grandfather. In his honor a visitation will take place at Bunkers University Chapel, 3529 E. University Dr., Mesa. Monday, February 1, 2010 from 6:00 pm-8:00 pm. Interment will be at Fort Logan National Cemetery in Denver, Colorado.